Open To The Public consciously extends the perimeters of VACANCY, generating a spatial structure involving door > gate > sidewalk > street > tunnel > web. The two-person exhibition features work by Brody Albert and Kaeleen Wescoat-O’Neill, and is the second of five formulations encompassing an eight-month study in artist couples. From the sidewalk, Driving in Los Angeles (The Fine Art of the Gesture), a 7-minute video, opens out onto the car-clotted streets of MacArthur Park. These hand-signs are culled from Los Angeles’ public fiction of roadway parlance, performed from the privacy of ones own car. Just beyond, a couplet of security gates lies closed, permitting access only to a belt of trampled gum spots. Collapsible Scissor Gates (Red), takes the form of commercial security gates commonly found throughout the Los Angeles urban landscape. 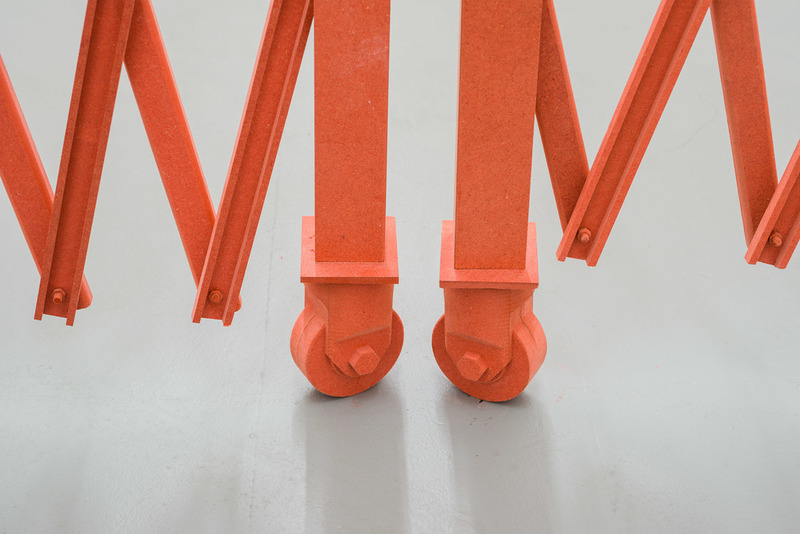 Carved entirely from dyed red MDF, the fully articulable sculpture is installed in the main corridor of the gallery, blocking access to the majority of the space. As a result, the sculpture disrupts the flow of traffic, forcing a detour around the building. For the run of the exhibition, the artists have colonized the gallery website. The video-based web-work, nothere.la, features an animation stringing together 8 tunnels across Los Angeles, creating a perpetual channel of cinematic non-space. Sourcing still images from Google Street View, the website features a video structurally similar to Collapsible Scissor Gates (Red), blocking access to the gallery’s virtual history. In survey, this exhibition explores the permanently transitory spaces of Los Angeles. The delicate pattern of traced gum spots borrows Hollywood blvd for the gallery floor. A duet of security gates reserves a DMZ, forcing a dolly around the building’s side. And hands wave goodbye out the front window, marking the gallery as a site of motion, blocked-off and redirected into an expanded detour(nement) of publicly local space. Brody Albert and Kaeleen Wescoat-O’Neill are Los Angeles based artists. Albert holds a BFA from Art Center College of Design and is a current MFA candidate at University of California, Irvine. Recent exhibitions include Fragment at UCLA’s New Wight Gallery and Wayward at Winsor Gallery, Vancouver. Wescoat-O’Neill holds a BFA from Art Center College of Design and is a graphic designer at Drawing from Memory. Albert and Wescoat-O’Neill founded the artist run gallery Office Hours in 2013.